A Wrinkle in Time is a YA science fantasy novel originally published in 1962. Author Madeleine L’Engle’s premise revolves around a plucky 13-year-old girl named Meg who, along with her younger brother and friend, travels through the outer reaches of the universe to find her dad. Read a bit deeper to find a message on the importance of nonconformity. Nowhere within the pages does a spiritual advisor compare Meg to Nelson Mandela, Oskar Schindler, Indira Gandhi and Maya Angelou and then proceed to cite a lyric from Hamilton. Director Ava DuVernay (Selma, The 13th) took this classic story and, in a terribly misguided decision, spun it in 2018 wash cycle. Surely her well-intended goal was to empower impressionable girls. The disappointing result is a nonsensical effort that tries to do much and flails in the process. Instead of a seamless visual prism of wonder and discovery, the film is divided into a series of clunky set pieces, each one wrapped up in a heavy-handed morality lesson. Our Meg Murry (a very solid Storm Reid) is a bright teen as well as a social outcast in a nondescript kind of way. She struggles even more after her astrophysicist father (Chris Pine) vanishes into some sort of wormhole. Her prodigal brother, Charles Wallace (Deric McCabe), tries to comfort her, while her scientist mom (Gugu Mbatha-Raw) is in a daze of her own. Then on a dark and stormy night, an eccentric woman named Mrs. Whatsit (Reese Witherspoon) visits the family and declares that “there is such a thing as a tesseract.” Whoa. That’s the scientific concept Mr. Murry was working on before he vanished — a means of travel in which time and space can be folded like an accordion. And he’s lost somewhere in the middle. Meg and her brother, along with their neighbor Calvin (Levi Miller) decide to go find him. And they’re going to need help. Enter the astral travelers — Mrs. Whatsit, Mrs. Who (Mindy Kaling) and a third, larger-than-life super-being that seems to manifest out of nowhere. That’s Mrs. Which, and she’s played by one Oprah Winfrey. So perfectly cast is this wisest of all spiritual characters that I shall hereby refer to Mrs. 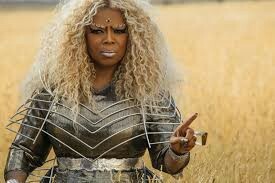 Which as Oprah. Mrs. Whatsit, Mrs. Who and Oprah show the kids how to use the tesseract method to leave the front lawn. They end up on a brightly lit planet dominated by dancing and talking yellow flowers that can be seen from outer space. But Mr. Murry has already come and gone. On to the next! This is how the plot unfolds, hopping from planet to planet all the while Oprah tells Meg to use her inner-light to shine. Just when I finally made peace with the actresses’ respective fright wigs, the women disappear. From the movie. It’s true: For all their high-profile interviews and magazine covers, the two Mrs. Ws and Oprah exit stage right as soon as the search-and-rescue mission gets interesting. Seems Mr. Murry is trapped on the dark planet of Camazotz, which is controlled by “IT.” No terrorizing clown, IT is an evil disembodied brain able to manipulate and bring out the sinister side of its inhabitants. If the kids are going to find Mr. Murry, they’ll have to first defeat the monster that lurks within themselves. Well, not Calvin. He has maybe four lines in the movie. I have deep respect DuVernay, a unicorn in the industry. In only her third movie, however, she directs with an unsteady hand. Unfulfilled by the source material, she adds in ill-fitting touches like musical montages courtesy of Sia and Sade. One eye-popping scene, in which Stepford kids silently bounce red balls on their suburban driveways in unison, serves little purpose in the narrative. She ensures the entire cast is diverse, yet Zach Galifianakis appears as a Zen master. And if Meg is such a unique and singular warrior, why does DuVernay also pan to random images of a girl struggling with her weight and a teen boy berated for bad grades? Mr. Murry even name-checks Bono and Van Halen, presumably to up his cool dad cred. A PG-rated movie doesn’t need to a guiding force of all things for all people in hopes that audiences don’t check their iPhones during the screening. Just stick to a wide-eyed sense of adventure and a streamlined, well-written story that adheres to one inspired idea. 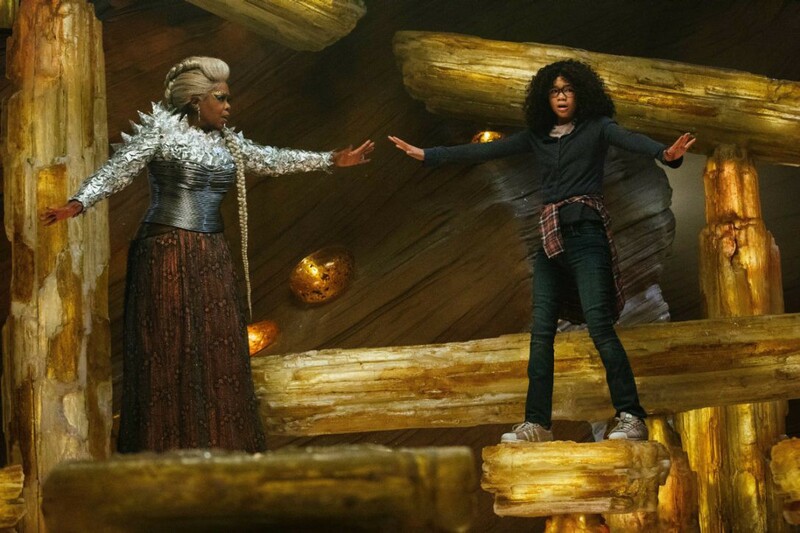 A Wrinkle in Time may be ambitious, but at the end of the journey, it isn’t timeless.